My son and I have been watching the Little House on the Prairie series on DVD. If you’re not familiar with this icon of 1970s North American television, it’s the story of a pioneer family in Walnut Grove, a tiny town in Minnesota in the late 1800s. We’ve watched them battle blizzards and crop failures, economic downturns and pandemics. And through it all, there’s something staring the viewer in the face – there was a world before electricity. And a big, rich one at that. People were resilient – they knew how to look after themselves, and bounced back from calamity. Of course, most of us find that life hard to imagine. The ‘electrification’ of North America fundamentally changed our society, family life, and the way we live. Whether that was for better or worse is a topic for another time. So imagine for a moment what it would be like to be without power at your home for a week, two weeks, a month, 6 months. Now, I’m no fear monger or doomsday-ist… doomsday-er? (is that even a word?). Nor do I identify with the ‘survivalist’ camp. Far from it. I believe that the massive changes we’re currently experiencing across the planet will lead to a brilliant transformed society once we come out the other side, but that there will be some growing pains during the transition. It’s those pain points where we can really make a difference by being prepared. Personally, I’ve never been through a power outage that lasted more than 2 or 3 days (at most). I find it hard to image what an extended outage would look like. But it we think it’s an impossibility, we’re sadly mistaken. Just ask anyone who has been through one, during war or disaster, and they’ll tell you all about it. So what could cause a power loss for longer than a few days? Natural Disaster – You don’t have to look far to find a lot of those the last few years. Floods, fires, earthquakes, tsunamis… all can disrupt electrical systems over wide areas for long periods of time. Even if you’re not in the directly affected area, these events can really wreak havoc. Weather Extremes – These are become more common as well, as the climate shifts and changes. Heatwaves can cause excess demand on fragile, antiquated power grids, as well as the conditions we saw across so much of the northern hemisphere in the summer of 2010 (and summers before that) that created massive wildfires, knocking out power over vast regions. And cold weather has the same effect on demand, with the added threat of freezing to death without adequate warmth should an ice storm or some other extreme event shut down power stations and distribution lines. Solar Activity – Here’s where you might think I’ve gone a bit ‘woo-woo’, but I’ve read many express concern that the next solar maximum is going to be a doozy, and there is potential for fragile power grids to be completely knocked out of service. For months. I don’t know much (OK, anything, really) about how the sun’s activity affects electrical systems here on earth, but I’m thinking NASA does. And they’re concerned (NASA space weather link). They’ve even got a map of the US posted that shows the areas that could be most affected due to the way the grids are constructed. Bottom line: we can’t do anything about this one but get ready. What Would a Long-Term Outage Look Like? 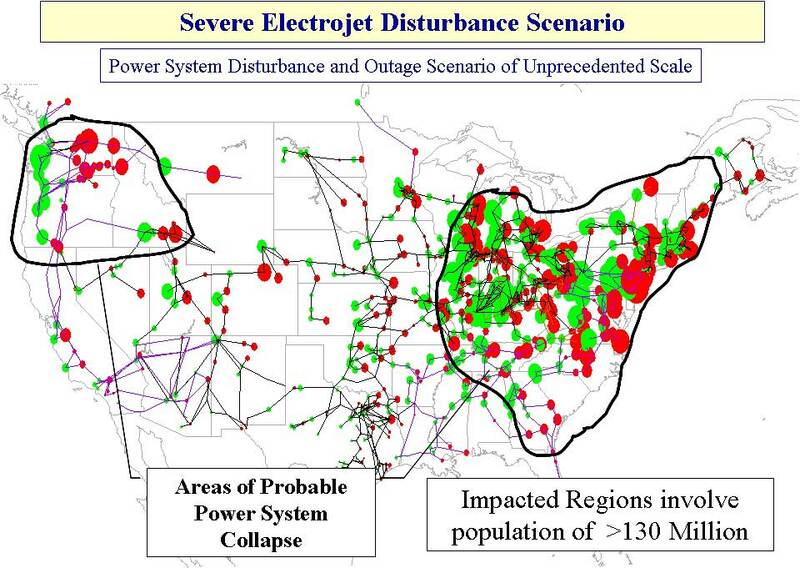 So say the worst happens and we get bombarded by a super solar storm and the electrical grid goes down just like in that map (or even parts of that map), for weeks on end. You couldn’t get money from a bank. Hospitals would likely be unable to operate at normal levels (or some, even any level – they have back-up power systems, but those usually rely on fossil fuels, which might not be available if the electrical systems that run the pumps and distribution system fail). Commerce as we know it would essentially cease – it would be virtually impossible to buy anything, anywhere. You’d have no hot water. You couldn’t fill your car with fuel. There would be no internet, no DVDs, no movies. In a mass failure, it would be unlikely you could use your cell phone. You couldn’t cook your food (But ‘my range is gas’, you say? As far as I understand, it’s all distributed through electrically managed systems). You couldn’t go to hospital to take care of any injuries. You’d have no refrigeration for your food. Depending on where you live, you might have no running water. Your plumbing systems might not work. It’s actually pretty frightening when you get past denial and let your brain go there. In all honestly, it used to completely freak me out. And obviously it’s freaked a lot of other people out too, because in the last couple of years there’s been an explosion of websites dealing with ‘prepping’ and emergency supplies. At first I thought it was all the crazy 2012 paranoia, but the more I’ve educated myself, the more I realize that the possibility of a massive power failure isn’t so crazy. Especially from the perspective of solar activity and natural disaster. Start small, and build from there. Sit down and make a list of how your life would be affected should such an event occur. Buy some emergency supplies. Plan for cooking and warmth. Learn how to grow sprouts. Upgrade your first aid training. Buy a bike and trailer. Get to know your neighbours. Most of all, do not go to a place of fear. There’s absolutely nothing to be afraid of if you take the steps now to get organized. Educate yourself, but I recommend you avoid the fear-mongering, conspiracty-theorizing websites – there are a lot of them and frankly, I think they do more harm than help… but that’s just my opinion. My goal is to have us all empowered and feeling good about our knowledge and skills. Comfortable with living without electricity. Confident we can not just survive, but thrive should the worst happen. Bottom line: the more each of us are prepared, the less chaotic any major electrical grid event will be. And really, what’s the harm in being prepared, just in case? Worst case: You are able to look after your family during an extended emergency, helping them stay comfortable and most of all, safe. Best case: (Which I’m hoping for!) you have a tonne of great camping food and will be all cozy when the next snow storm takes out power to your house. I can’t really find a down side. Can you? Funny thing is, in the days depicted on Little House on the Prairie, a doozy of a solar maximum would have probably had no effect whatsoever. Depending on what you need for your emergency kit and your budget, you can either build it yourself or buy everything you need already prepared. We’re in the process of putting our supplies together, and will be reviewing different emergency food options on our website over the next few months. You can figure out what you’ll need using the handy planning sheets you’ll get when you sign up for The Ready Store’s newsletter. Most of the online resources are in the US, but if you’re in Canada or another country, ask at your local emergency planning office, or do a search online and you’ll come up with all sorts of options. This is a very thought provoking article. “What would this NYC girl do if EVERYTHING came to a skreeching halt?” … This really is something for high rise dwellers to really consider. Excellent info Victoria !! It’s definitely challenging, and something for the strata or building owners or residents to ponder as a group. I used to live in a 120 unit townhouse complex in the city, with no central storage or anywhere to keep much of anything. It’s time we start designing buildings with these things in mind, but with real estate values so high, especially in cities like New York and Vancouver (average, tiny apartment starting at about $350K and up), I’m not sure how that would work. It’s quite the pickle, but not insurmountable. Even just a basic emergency kit with 3-7 days of supplies would be a huge help! They’re easy to buy and quite compact – compact enough to store in an apartment, for sure. Let us know how it goes if you decide to start putting supplies together – it would be a great story to share. Just having come from a year+ in rural Wyoming and into semi-country living in Montana, I can imagine many people out West will have it much easier than those in the heart of cities… your website will hopefully help to open eyes, because even in the cities and suburbs you can take precautions – the suggestions you have in various articles on your site are extremely helpful and you present everything in bite-size, “I can do it” size pieces – I really appreciate you, Victoria! Thanks, Susan. That’s my goal – to help everyone, city or country, get set up so they can thrive should these events come to pass. There’s a lot to do, and it’s challenging to think of it in little chunks, but it’s the only way to get it done. It’s WAY too overwhelming otherwise. Thanks so much for your comments! This is a real eye-opener! We spent a total of almost a month without electricity in 2004 when Florida was hit with three hurricanes back to back. The longest period was almost 2 weeks…nothing teaches like firsthand experience but I sure wish I had your article back then!!! My first response to your question was “READ”. Then I read your post and I am impressed. What a wealth of valuable information, thanks. I am slightly more fortunate since we embrace country living on our little farm. We have a generator, burn wood from our own land, and often joke that this is where the party will be if the power goes out. Parts of your post made me laugh out loud, don’t think I’m going ‘woo woo’, but my husband keeps eyeballing a tree that may fall on some lines and I joke with him to stop thinking about it or he will manifest our next power outage. It’s good to be prepared and your article is going to help a lot of people do that. I am sharing. Thanks. I grew up with the Amish mind set. My grandmother was Amish. I’m reverting back to the “ways” because it makes me feel secure. I know first hand how to preserve food and live off the grid. I remember the evenings sitting by the cook stove playing games on the floor or being read to. I also remember all the work canning and smoking, but it was not work and you looked forward to doing it. Nothing was wasted. Corn was canned and dried. The husk was dried and used for stuffing and braiding matts. the cobs were dried for fire starting. At night, when we went to bed, we would lay our clothing out on the bed and put a sheet or that and sleep on our clothing. In the morning we could get dressed under the covers without freezing. In the evening it was someone’s job to put the bricks on the cook stove to heat them. They would be slipped into bags made out of ticking and everyone got for there bed. Life was full of little thing to look forward to . I don’t think most people understand how cold a house can be in the morning without central heat! Thanks so much for sharing your experiences. Fantastic information. I really enjoyed the article. I do think one of the things we should include in consideration in the event that we are without electricity is the fact that . . . back then many things were in a much more pure form. Back then the world’s population was not as large as it is today. Water wasn’t as contaminated, etc. So, yes, we did, can and will survive without electricity and there will be a lot less of us. There are many great ideas of how to make this work here. Some of us have lived through this and know how; many of us would not have a clue how to survive. So, I want to say thank you for posting this very important view of how we can continue to thrive as humans in the event of a catastrophe. or “Better a thousand times careful, than one time dead”! Major problem not addressed is your friends and neighbors. When you are all supplied and equipped, what happens when your neighbor,who has watched your kids, helped you fix a plumping leak and such,shows up begging for water and food to feed his kids. Do you deny him? Do you shoot him? Do you give up some of your supplies? If you give him some supplies, he may tell your other neighbors. The next thing that you will know, you will have several of your neighbors at your door. If you even give them a little your precious supply will dwindle very quickly. How do you tell your best friends, your neighbors, that you can not give them any supplies, or do you just give it out quickly until there is no more. Sort of beats the prepping unless you can make some very hard choices. Having a 12 volt standby solar powered system and light is wonderful. It also makes you viewable at night from a distance by parties in desperation looking for shelter. You may not want to meet these people. Surviving means you have to become a “mouse”. Leave no sign or trace. Disappear. A cabin on a lake wired with standby generators and full lighting is just a big target for desperate people, probably with guns, to come and take it away from you. So much for all that money and prep you did. You just made yourself a major and probably fatal target. Everyone has to make their own decision in that regard, for sure. The person who was my ‘rural living mentor’ believed and taught the opposite, but I know many folks who feel the same as yourself. Definitely a personal decisiion. Its coming to a halt……..right now. South Florida, pre Hurricane Irma. Power expected to be out for weeks if not months.